When it comes to the question of whether the UK ought to stay in the EU there are two key considerations. Is continued membership the best solution from an economic perspective (trade, regulation etc) and also is it democratically sustainable? (Others will also cite 'influence' and geopolitical clout). Leaving aside the first consideration for now, the second one has long generated a heated debate, not least in the comment section of our blog, with some regular readers pointing out to us that a majority of the UK public wants to leave the EU. End of story. 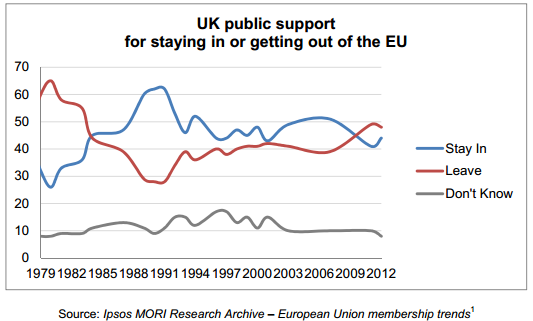 In his Europe speech, David Cameron warned that support for the EU was “wafer-thin” – which as we highlighted at the time was a long-term trend (albeit exacerbated by the crisis). Recent polls have shown an ever larger margin in favour of exit, with a widely cited ComRes poll over the weekend showing that 46% would vote to leave, 24% would vote to stay in, with 30% undecided. However, there is, of course, an important sub-story here. While this and similar polls have been interpreted by some as a mandate for withdrawal, when a supplementary question about restoring “some EU powers” to the UK is posed, the proportions change quite dramatically with 43% (including 48% of Conservative and 20% of UKIP voters) voting to stay in, 24% voting to leave regardless, and 34% undecided. These figures are consistent with the results of similar questions asked in a number of opinion polls in recent times. In fact, restricting the choice in the EU debate to only In/Out is rather odd. How often does that happen in other areas of public policy? Would a choice between a 100%, all encompassing welfare state or no welfare state at all, for example, be a fair choice put to the British public? Unlikely, as most of the public wants something in between. That we consistently see such a large swing in opinion from 'Out' under a straight In/Out scenario to 'In' under renegotiated terms shows that one of the clearest trends in UK public opinion is that the UK public wants to see new EU membership terms first, and only then withdrawal if that fails. As such, for those who cite the issue of democratic legitimacy as their prime motivation, whilst they most certainly have a point, there is no reason not to at least give Cameron a good shot at his strategy of re-negotiation followed by a referendum. The democratic question is also frequently cited by those who demand an immediate referendum, including the MPs who voted in favour of the amendment to the Queen’s Speech last week. However, buried in the poll data was an interesting finding that ought to provide some food for thought – 20% of voters (including 52% of Conservative voters) said they had more sympathy with David Cameron while 18% sided with backbench MPs. Meanwhile 48% said they did not have more sympathy for either side. If there was an overwhelming support for an immediate UK exit - as opposed to substantially reducing the EU's powers in Britain - one would have suspected far greater support for the handful Tory backbenchers who are pushing for an early referendum bill. This isn't to say that there is a major trust issue when it comes to Europe, and that some Tory backbenchers didn't make valid points last week, but merely that the public, again, is basically quite content with the basic idea of the UK negotiating new membership terms followed by a public vote. At the same time though, politicians and officials who think they can fudge this process or procrastinate over addressing the EU's involvement in too many areas of national life ought to be very careful. The electorate's desire to staying the EU is clearly predicated on substantial reforms taking place. Giving DC a chance at renegotiation is fine by me but the electorate should establish the framework for that by setting out what they are prepared to accept and that they are not prepared to accept. Its our sovereignty no one else's and we will decide. In reality this goes beyond politicians and the Bill for a referendum should have a clause that guarantees the public the facts not political rhetoric. I am so fed up hearing the untruth that 3M jobs depend upon membership when they do not. Criminalising misleading statements to the public would be a good starting point. Show's Cameron has a strong mandate for reform with the EU. "Would a choice between a 100%, all encompassing welfare state or no welfare state at all, for example, be a fair choice put to the British public?" Completely false analogy, as is any largely domestic policy. It is baked into the EU that it gathers powers - the Acquis - to itself and doesn't reverse them. And the majority of countries involved are completely, almost religiously behind that process. There is No repeat NO precedent in the EU's history which you find so blindingly obvious. There is already evidence to suggest this latest bleating about renegotiation is a chimera. Which begs the question, what is your game if/when the mooted fundamental renegotiation fails? Will you then call for exit? I'd genuinely love to know. An unaccountable elite (who except themselves would call them an elite?) who makes up unwanted and not needed regulation like the recent one about olive-oil? Would the olive-oil regulation be more acceptable if we had been allowed to vote (democratic principle, less democratic deficit?) for the ones forcing it upon us or would it be better if the olive-oil regulation didn't happen at all? If the subsidiarity principle was respected then the olive-oil regulation would not be a supra-national regulation, it would not be a national regulation, it would not even be a local regulation. Is the current form of the EU suffering from democratic deficit or does it interfere where it shouldn't? Or maybe both? However you have to realize that that process will have to go via polls and media discussions and not via an official democratic way. The reneg process is simply highly complicated and technical. As would be with an exit btw. Nobody really has a clue was has to be done at present. Governments have since decades basically signed treaty-like legislation as if it were Christmascards. From the other side DC would be a complete moron if he doesnot take notice of what the UK public wants from those negotiations (and what works for UK business). Fully agree that it would be better if all parties could get to some consensus on what has to be done. However it is clearly not that far. Conservatives/DC of the parties that have a chance to be in a next government are the only one with a more or less clear policy. The others are still moving all over the place. But that is simply a fact of life, a given at least at this stage. The 3M jobs thing looks indeed completely out of proportion. And basically will act counterproductive with a lot of the pro-exit people (and with a few others as well, dramaqueens might be funny but are never really popular). A lot of people are not buying it. What the 'Virgin' group that keeps spreading these rumours seem to miss is that this EU thing needs to be solved. You cannot especially in difficult times like now (and the decades ahead) have this discussion coming back. It is not Quebec (where it killed partly the economy off). And in the UK it will come back (at least everything looks like that and likely with a vengeance if not properly solved). In other words you only have the 'exit front' shut up if there is a fair referendum in which their views are denied a majority (with some margin). However UKip and Co should realize that presenting an EU exit as a 'one day' event is simply causing this sort of reactions. Simply stepping out might indeed do that much harm. As half the UKs international trade and probably more would take a big hit and nobody would invest in it as European base (probably a lot of those would be even relocated). If you want to avoid sudden exit scenarios you should try to avoid them yourself as well. Even if the UK would leave that is not going to happen. Always some sort of freetrade zone will be kept in one form or another. However that means negotiations as well and is not an 'overnight' thing. UKip have to realize that at this stage simplifying things might get them some votes, but that it also will attrackt a lot of opposition from the businessside as long as they donot make it clear that the fall back position will be a sort free-trade zone and not nothing. Would be even better if UKip would make itself strong that the trade arrangements the UK has with third countries via the EU would for mutual benefit of all involved not be jeopardized. Wait till real companies see doom for a big part of their trade because the rules they will have to work under will get worse (for any reason) they will start to make a lot of noise. And unlike with the 'Virgin' crowd my bet would be that people will buy in on that. So I would personally be strongly for a lot more realism in both the 3M jobs lost as well as the exit camp. Is there no poll simply asking the question : "Are you satisfied with Cameron's proposition of negotiating new membership terms then having an In/Out referendum on these new terms?" ? This is a slanted option: stay in an improved EU is an option which does not exist. It is a sinking ship and we need to cast off in our own national lifeboat. This whole concept is a nonsense. We have a situation where "negotiations" are supposed to take place but can't without the use of Article 50. Then we have a prime minister hell-bent on staying in - he says so - before these mythical negotiations !! The only things that might be be on offer would be things that do not matter and would not require Treaty change and as such would be treated with contempt by the public. There is no "sub story" here, except the one manufactured by Open Europe and other Eurofascists, who are determined to keep the UK trapped in the EUSSR to serve a corporatist agenda. It really does seem as if OE have become increasingly EU Lite since the opening of their Berlin office (HQ?). I agree with Anonymous that a List of "Red Line" essential Changes should be drawn up, if any fail to be granted, then an In or Out Referendum is held. The EU Commission or its agencies, may not be permitted to fund or influence the Referendum campaign in any way, as they did so cruelly in Ireland. Essentially the UK can remain in the EU on condition that all Laws are drafted ONLY by British MPs with no input from the EU. Justice will be restored to the UK with no EU Court of Appeal on matters relating to the EU. Energy policy will be made in the UK. Finance will be a British only consideration. Foreign aid will be decided in the UK only. The essence of the matter is that the UK will remain a member - a non-political member of the EU as a trading partner and nothing else. I agree with Christina Speight in that All and Any negotiations, are set out following invocation of Article 50. Let us not play games with the UK's future as has been done since Edward Heath's time. These are the conditions of the people of the UK - take it or leave it. Is it rude to say that as a pretty average person I'm fed up listening to discussions that postpone this issue. Negotiation is going to take years as the EU Commissars will not take kindly to losing power, how will the public know what the end result of negotiationmeans for them. The CAP costs far too much and so far reform has been painfully slow. Despite the EU "controlling" fishing, fish stocks are crashing. The EU economy is in freefall with 7 or perhaps 8 countries in deep trouble. The Auditors have not been satisfied with th accounts for 18 years. Everyone keeps on about Cameron's renegotiation. But when can we expect this renegotiation to start or has it already? Quite right. Put simply, before voting "in" or "out", we need to know what "in" and "out" mean. Does "in" mean "in as far as we are in now, but no further" (how realistic? ), "in having repatriated some powers" (which? again, how realistic?) or "in all the way, accepting the Euro, Schengen and whatever further deepening may follow"? And does "out" mean "out like Norway", "out like Switzerland", "out like Turkey", "out like Russia", "out like Papua New Guinea" or something else again? Given the size of the EU and (assuming we're out) its proximity to our borders, the only option which is not available would be to have no relationship at all. Indeed, some versions of "in" could, practically if not politically, look just the same as some versions of "out". Shouldn't the first question be not in vs out, but what do we actually want from our relationship with the EU? Yes, he continues to give away our negotiating position daily. If he was a metals trader, he'd belong to the Gordon Brown school of sheer stupidity.